Fall brings many great things. The crisp cool temperatures mean you can break out your favorite sweater again, the damp scent of leaves and earth tell you that Halloween and Thanksgiving are just around the corner, football (need I say more? ), and now it also signals the arrival of a new passion for at least one member of my family: Cross Country! 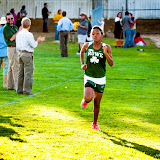 My daughter started running cross country last fall and had a great time. She is having an even better experience this year and I've enjoyed documenting the events through pictures as can be seen in the photos and the linked gallery, below. And the girls are off and running! And it's Happy Valley by a narrow margin! Categories: "Cross Country", "HVMS XC", "HVMS", "Happy Valley Middle School", "Oregon", "Running", "Sports", "Youth Athletics"